Just a little while longer to get in your SKETCH FOR YOU TO TRY entry for February. The link list closes tomorrow at noon CST. Play along for a chance to win a $20 gift certificate…just in time for the next release on March 8th. Hello ‘Fetti Fans and welcome to the one and only sneak peek day for our special October mini release! As you know, we release every other month and this month is one of our non-release months; however, we have a few products that we just couldn’t wait to share with you! You will be seeing a sneak of all of the products today and they will release tonight at midnight EST. Tomorrow is another day filled with tons of fabulous inspiration from the Confetti Crew. Don’t forget to leave a comment here and on each sneak peek post and hop post for a chance to win! On Facebook, simply leave a comment under the graphic. One person that comments on the graphic by 1pm EST on October 8th will be randomly chosen to win a $15 gift certificate to the Reverse Confetti store. Winners for both the blog comments and Facebook comments will be announced here on the Reverse Confetti blog as well as on Facebook. You know the drill…grab that cuppa joe, sit back and enjoy some fabulous inspiration here and from the rest of the Confetti Crew! I am so excited to share these new products with you! These are items that are unique to Reverse Confetti and can be used year round. I am especially excited about them and their potential for AWESOME holiday creations! Without further adieu, let me introduce you to the 2 new stamp sets and 2 new Confetti Cuts that will be available tonight at midnight EST. What in the world is this, you ask? This sweet lil’ die creates a door hanger. The new HANGING OUT Confetti Cuts die cuts out the top notch that goes over the door knob. Note, this is created with a 4.25″ width of cardstock, which I find to be the optimal width to have the circle centered. 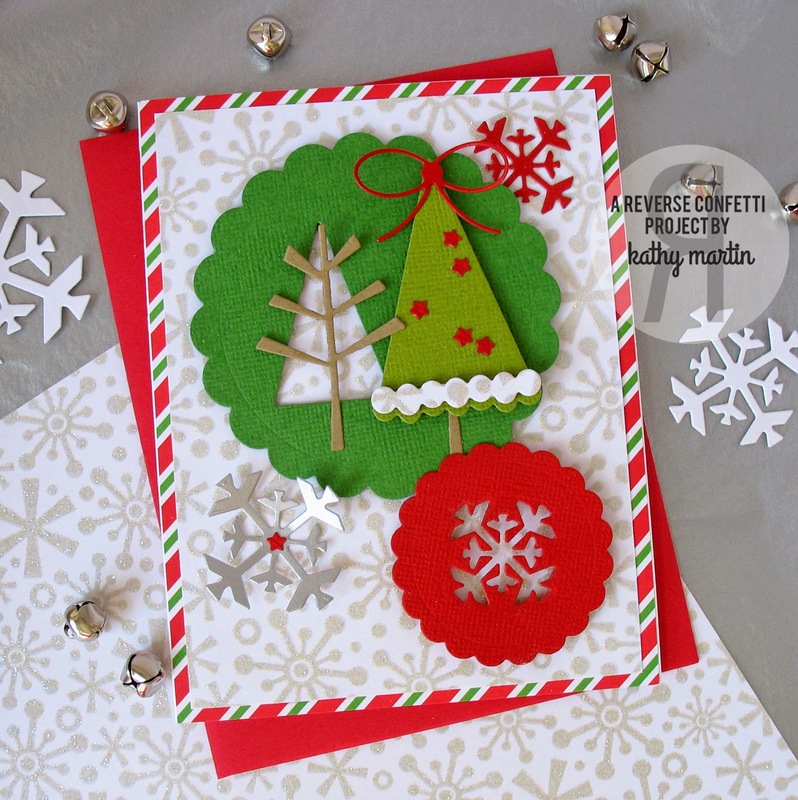 The wreath on this card is created with the leafy swag from the PETALS ‘N POSIES Confetti Cuts die set (cut from felt). I added sequins and rhinestones for the berries and topped it off with a double tied twine. The sentiment is from our festive sentiment building set, BRING ON THE MERRY. I’ll be using this door hanger instead of a card for one of my friends this holiday season. On the heart (cut from the LOVE NOTE Confetti Cuts die set), I’ll sign my name and leave it on her front door. I’ve created 2 more projects with the new HANGING OUT die that I will be sharing with you tomorrow…when I get back into the Halloween spirit. The HANGING OUT Confetti Cuts die is just one of the four products that are part of our special October mini release. 1. Use the ENVIE WRAP to create unique and interesting envelope, packaging and more! 2. The circle portion of this die is the same size as the large non-scalloped circle in the CIRCLES ‘N SCALLOPS die set. You can stamp the ROUNDABOUT or ROUNDABOUT ADDITIONS directly onto the ENVIE WRAP or stamp them on a circle cut from the CIRCLES ‘N SCALLOPS Confetti Cuts set and pop them up on the ENVIE WRAP (as done in the project below). 3. The gray lines on the product graphic indicate debossing lines. 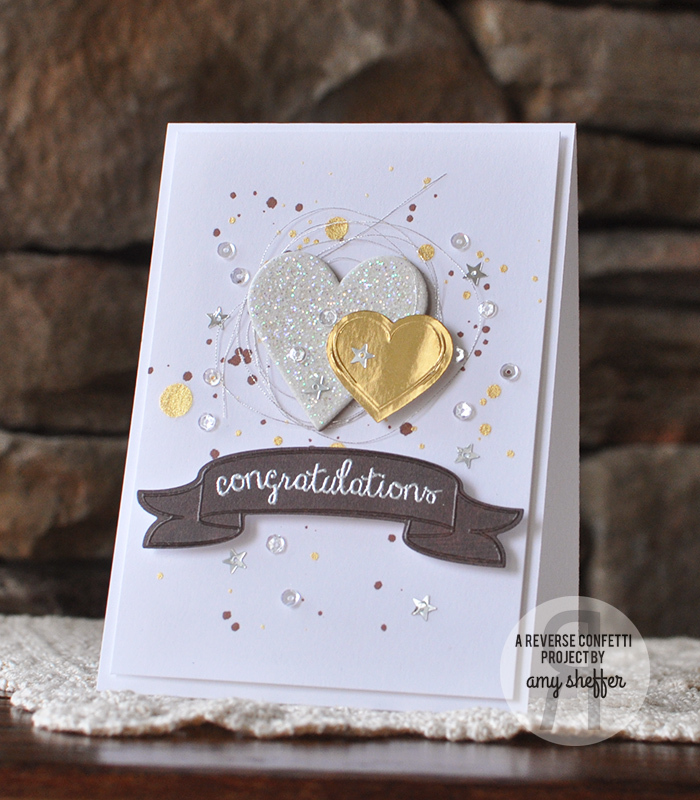 We added these for extra detail and to coordinate, again, with the CIRCLES ‘N SCALLOPS Confetti Cuts die set. 4. 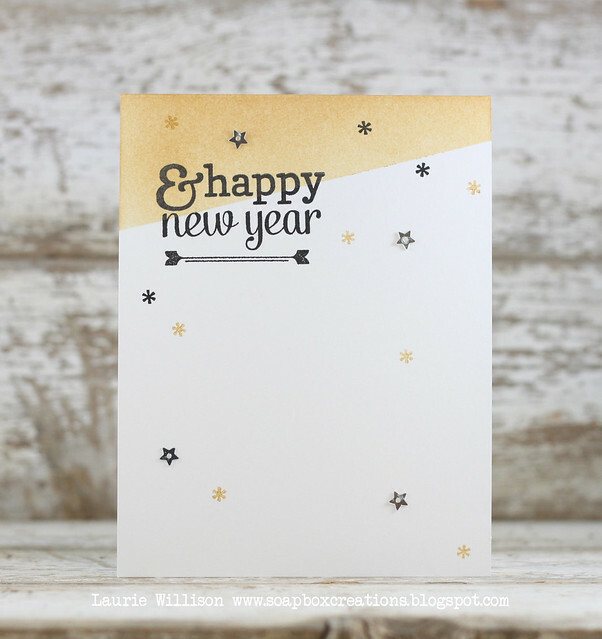 The smaller sentiment circles are made to fit on the reverse of the ENVIE WRAP, if you don’t use the return address lines or they also fit in the smaller, non-scalloped circle in the CIRCLES ‘N SCALLOPS Confetti Cuts die set. The above “thank you” ENVIE WRAPs are not intended to go through the mail, but you can make them so that they can go postal. First, make sure that the ENVIE WRAP is secured to your envelope. It is best to use glue instead of tape runner in this case. Also, be sure that it is flat. If it is not totally flat, you can always put it in a clear envelope. As always, check with your local post office for any additional postage fees (although, I don’t think there should be any), etc. I created the bokeh effect on this ENVIE WRAP using the additional circles in the ROUNDABOUT stamp set and masking the circle portion of this die cut. Just imagine how darling your Christmas and holiday card will be with this ENVIE WRAP on the envelope! I used aqua for my bokeh effect, but I think red and green or even just gold would be absolutely FABULOUS…of course, you could just use some festive pattern paper, too! 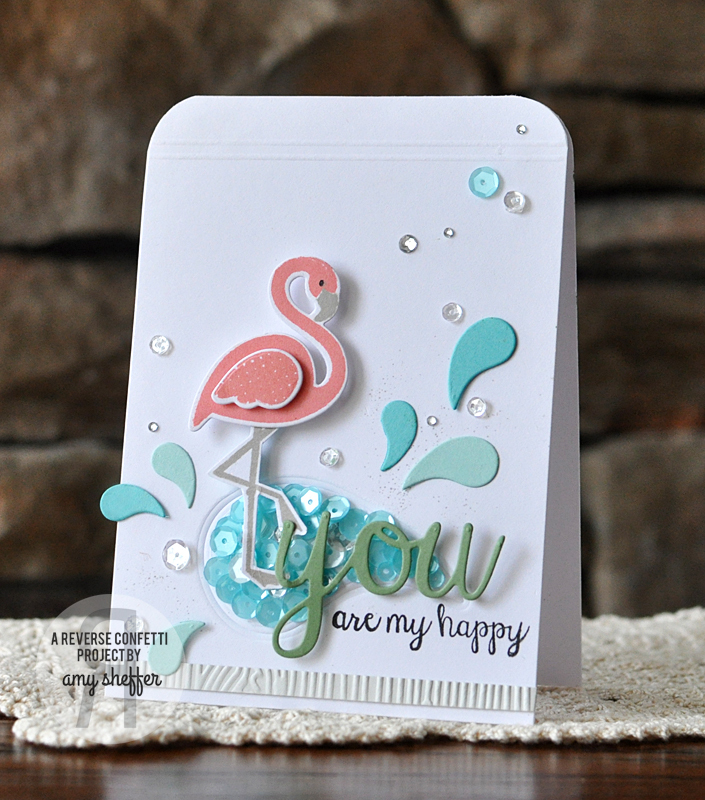 There is so much more inspiration to see using these stamps and dies that are releasing tonight at midnight EST! Around and around we go! 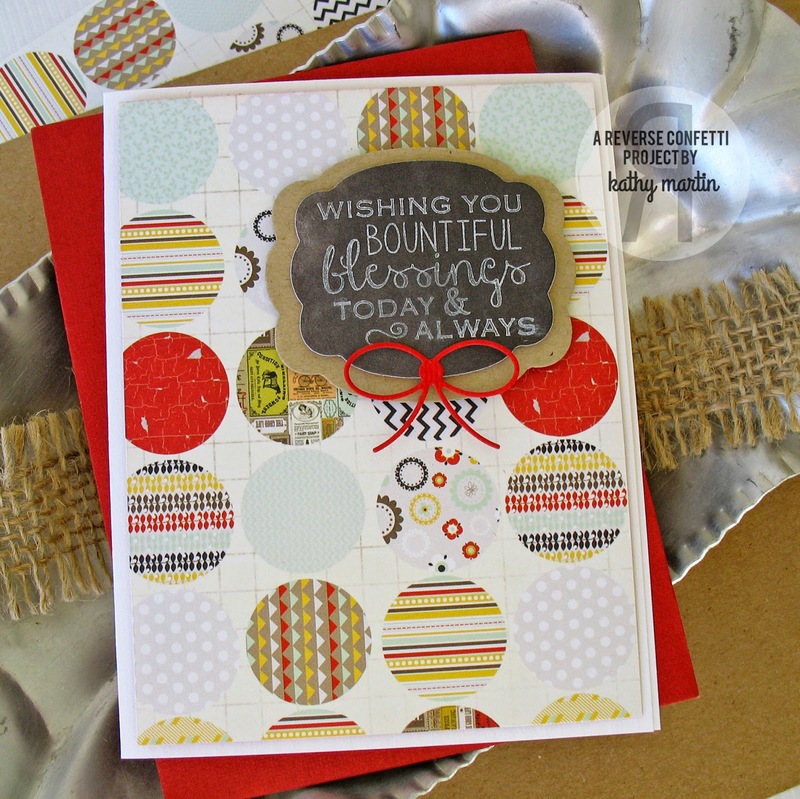 Have fun with these great versatile circle sentiments made to coordinate with the ENVIE WRAP Confetti Cuts die and the CIRCLES ‘N SCALLOPS Confetti Cuts die set (both large and small non-scallop circles). In addition, the dashed lines create the return address portion on the ENVIE WRAP Confetti Cuts, die. Also included in this set are 4 circles so that you can create your own bokeh effect project, or just use them as the polka dots (my favorite!). Around and around we go…some more! Have fun with these everyday (including holidays!) circle sentiments made to coordinate with the ENVIE WRAP Confetti Cuts die and the CIRCLES ‘N SCALLOPS Confetti Cuts die set (both large and small non-scallop circles). In addition, the lines create the return address portion on the ENVIE WRAP Confetti Cuts, die. 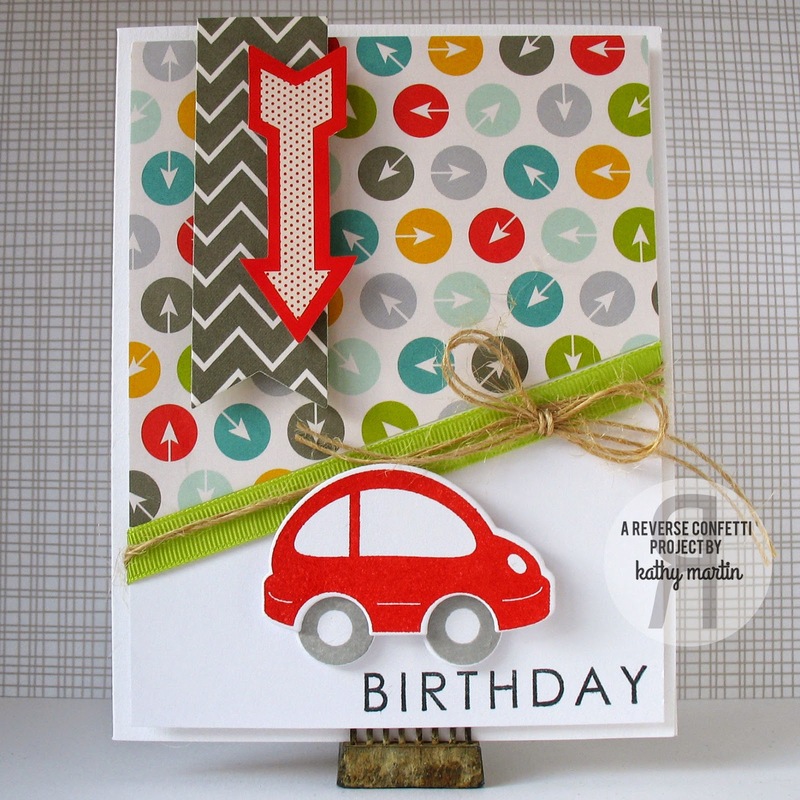 The Hanging Out die creates a cut out to create a door hanger. Imagine leaving a festive door hanger on your neighbor’s door or creating one for yourself. You know that the kids will love them for themselves, their friends and teachers! 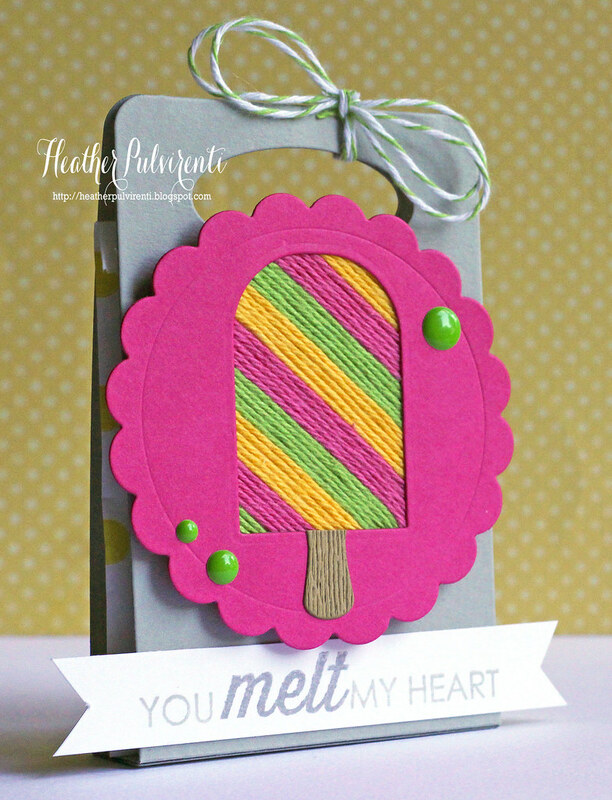 Create fun one-of-a-kind door hangers easily using the Hanging Out Confetti Cuts die. While you can use this on any size cardstock, note that best results for centering the cut out hole are done using a 4.25” width sheet of cardstock. Hello ‘Fetti Fans and Happy Friday! It’s the start of a long weekend and the kickoff to college football season…wahooo! I hope to get some stampy time in, too! I’ll be back tomorrow announcing the winner of this month’s Color Challenge, but today we have the WEEK IN REVERSE where we take a peek at what the incredible Confetti Crew has been up to this week! 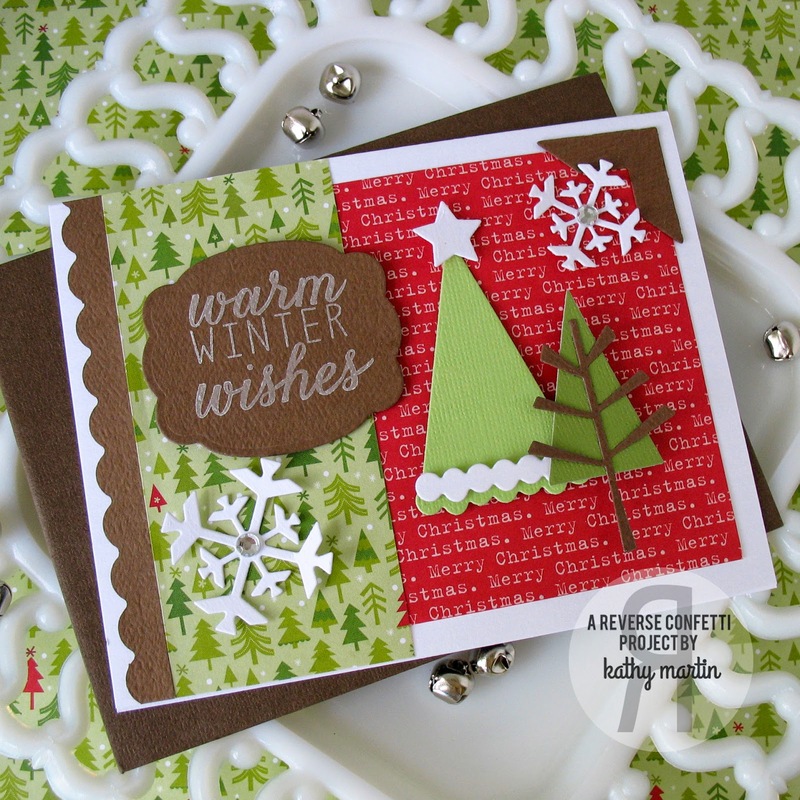 Many members of the Confetti Crew created cards this week for this month’s Color Challenge. Scroll down a couple of posts, or click HERE to see their colorful creations! It’s time for WEEK IN REVERSE where we take a quick peek back on what the Confetti Crew has been up to this week. Last, but not least, Savannah O’Gwynn. With this card, we bid Savannah adieu. We have loved having her on the Confetti Crew and wish her the best in her future endeavors.